����������� Today's Snack: Encourage yourself to love healthy snacks with raw veggies: celery sticks, baby carrots, broccoli sections, a green pepper ring, a handful of grape tomatoes . . . a little of several high-nutrition vegetables with "snap" will encourage you to leave sweets and salty processed snacks behind. Drink a tall glass of water, too. Atta Boy! Or Atta Girl! If someone has lost a job, or is sick, or was hurt in an accident, or was victimized by crime, or got a bad grade on a test, or got cut by a sports team, or their friend moved away, or their favorite team lost a big game, or they just seem quiet and sad lately - you can make an incredible difference by sending that person a short but sweet rah-rah note, just cheering him or her up. You can make a similar impact by sending someone a note of praise or a compliment out of the blue. Make up your mind to write an "Atta Boy" or "Atta Girl" note to someone every week for a semester, and see what happens! Your adult leader can teach you how to write the date on a note, how to organize and write the salutation, body and signature (if any) on the note, and how to write the name, address, and city/state/zip on three lines on the envelope. If you're using a stamp, you'll need the second two lines; if you're going to hand-deliver the note to the person's home or office, you can just have the person's name on the envelope. Besides being a nice, thoughtful gesture, this is a great way for kids to practice their writing skills! Conduct a used stationery drive at your school, your church, or among your friends and family. Everyone has some unused greeting cards, stationery, cardstock, envelopes and other items sitting around the house that they might want to donate. It's pretty easy to obtain a nice supply of miscellaneous stationery that way, it's "upcycling," and it's free! 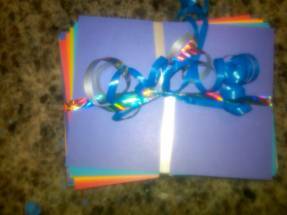 Or make your own notecards: Choose five different bright colors of cardstock paper, and cut each one in fourths with a paper cutter, if you have obtained envelopes of the right size. Change the size of the cards that you cut to fit into whatever envelopes you find. You can make this into an assembly line if there are a lot of students participating. Make sure an adult is there to help you keep from cutting yourself! Wrap up your stack of notes and envelopes with ribbon and curl the ends, to make your stationery easy to take home, and a colorful reminder to you to get going. Maybe you will want to write your Atta Boy / Atta Girl note every Monday after school; whatever schedule works for you. You can discuss the advantages and disadvantages of staying anonymous - keeping your identity secret so that the recipient doesn't know who the note is from - and discuss how to deliver notes without getting "caught" if you're choosing to remain anonymous. You can discuss sending these notes by mail (stamps are expensive these days!) or bringing them in person, but making sure the person gets the note. For example, don't leave a note on a person's doorstep because it might blow away. Be sure to keep the names of the recipients and what struggle they are going through totally anonymous and confidential, to protect their privacy. ����������� Each week in your after-school group, you can share stories of how the people you sent an "Atta Boy" or "Atta Girl" note to responded. You may be amazed at the "ripple effect," as someone who has been encouraged turns around and encourages someone else! That will be the best part of all, and will no doubt turn you into a lifelong encourager - a wonderful, wonderful asset to all of us!